Part of the information herein stated belongs to Doctor Borja Frutos Vázquez’s doctoral thesis, which was performed at the Polytechnic University of Madrid: Experimental study on both the effectiveness and viability of different structural solutions to reduce the concentration of radon gas in buildings. 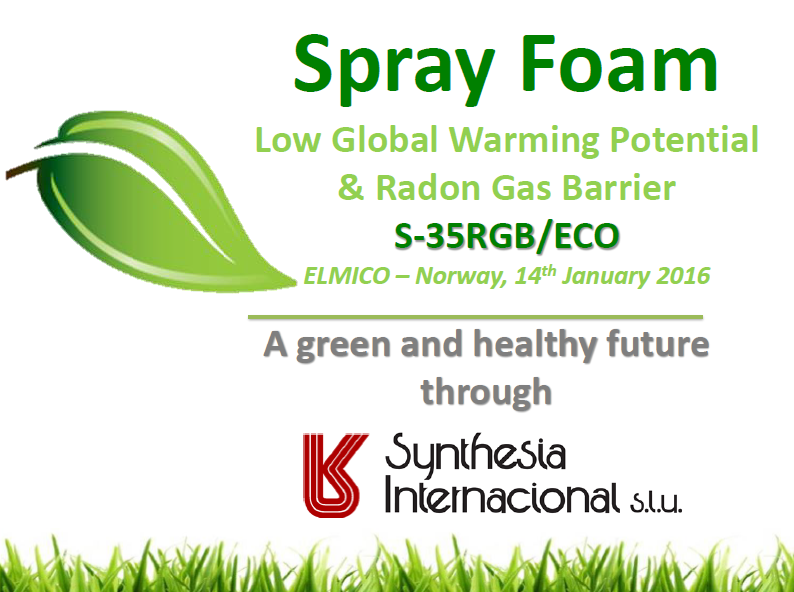 Other data come from researches conducted by Synthesia Internacional on the S-35RGB-ECO polyurethane system, a system that works as a barrier against radon. 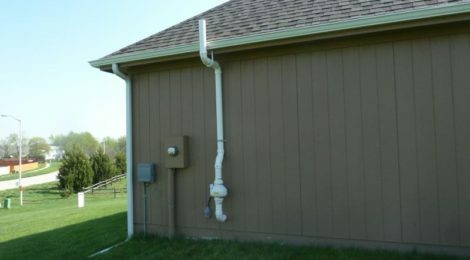 As we mentioned in previous lines, there are two methods of reducing radon gas inside an already built building: by ventilation and by installing an anti-radon barrier. Natural extraction by central and external manholes. Natural extraction by central manhole. Natural extraction by external manhole. Forced extraction (56 W) by 1 manhole (central). Forced extraction (80 W) by 1 manhole (central). Forced extraction (80 W) by 1 manhole (exterior). Pressurizing (80 W) by 1 manhole (central). Forced extraction (80 W) of the air from the basement (we remind you that the basement is one of the main entrances for radon into a building). These measures reduce the presence of radon inside a building, as we can see in the following graph. As an alternative to ventilation, according to different studies, anti-radon polyurethane barriers are used. The results obtained are an example of the water-tightness action of this material. 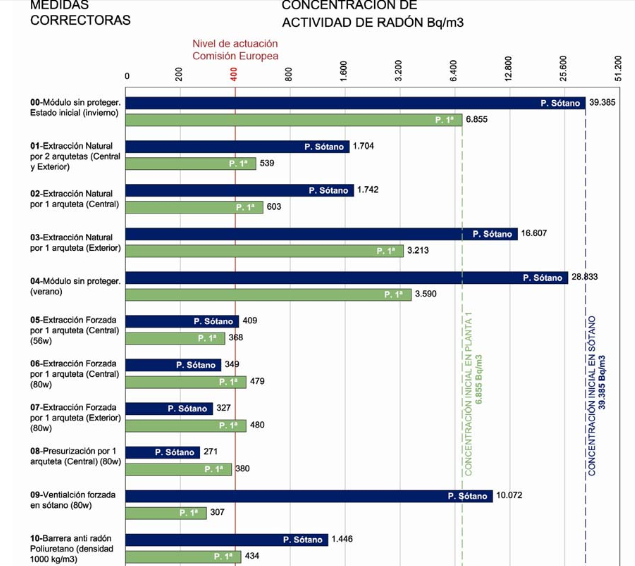 This graph shows how, from an initial situation of presence of radon gas of 39,385 Bq / m3 in basement plant and of 6,855 Bq / m3 in first plant, a reduction is obtained to 1,446 Bq / m3 and 434 Bq / m3 respectively by applying a polyurethane anti-radon barrier of density 1,000kg / m3. It is ecologically formulated (not HFC), with an ultra-low GWP and it’s non ozone-depleting. It has a thermal conductivity coefficient of 0.020W / mK – 0.027W / mK. 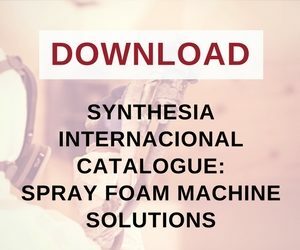 It has a classification of reaction to fire Euroclass E.
Please, does exist comparison with test made with F 75 Urespray ? 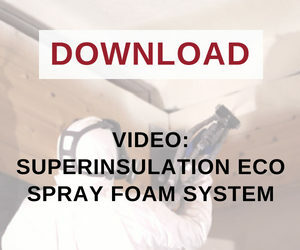 ← Spray Foam Insulation. An optimal insulation.